2Go Travel Promo - SuperFerry Promo 2019 to 2020: 2Go Travel Promo Fares Valid for 2017! During the event, known experts in the industry will dispel myths and ignorance about cycling by sharing their best practices and ethical standards when riding motor or bicycle, the groups said. They said some 20,000 forms will be filled up by participants to reinforce their commitment to respect and to observe bike lanes, to pledge proper maintenance of motorcycles and to promote safety driving. Top three groups that will come up with the most number of signed petition forms will win cash prizes, the groups said. the bike lanes of Edsa all the way to WTC for Live to Ride 2016 — A Unity Ride. It will be a fusion of motor riders and cyclists passing through the busiest roads of Metro Manila, a testament of harmony and assertion of their rightful spot on the roads, said Jeffrey Sonora, Republik’s director. kasali po ba sa fare ang 6 yrs old,3 yrs old and 10 months old? bakit now nagpapabooking kmi sabi wala dw ang promo n ito ? pwede po malaman kung may promo ba ngayong December? update niyo naman po aq. anong date po Ang promo ngayong December ? I need your reply ..
can i inquire how much po yung fare month of April2017 hangang march lang kasi nakita ko. Magandang araw po! Mayroon pa rin po ba na promo na schedule ay january 15,2017 ang ship?thank you in advance po! 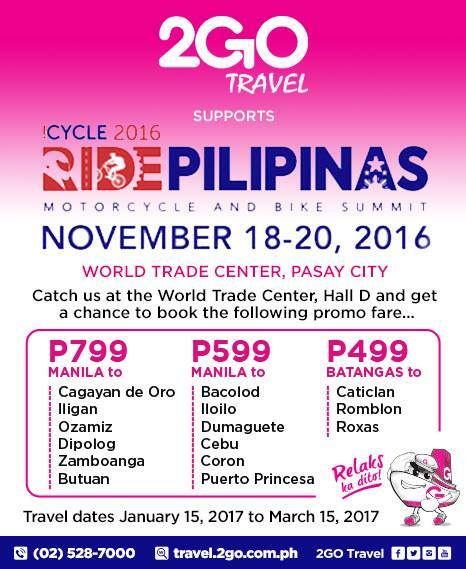 anung araw po ba ang byahi this week saan po pwidi mag book cebu to manila.thank you po..
pwde pa po ba ma avail ung promo nyo ng dec.30 na 599 na ticket from manila to bacolod if ever magpabook ako bukas....ay promo paba kayo??? good morning po,ask ko LNG po kng may promo b s buwan ng may 2017 at kng mgkano po? Hello po ate ask ko lng po kung nasagot po itong tanong nyo thanks po..
Is this promo available until now? Gud am ma'am/sir..ask q po sana kng magkano po ang fare fom dumaguete to manila?? Pag may promo mas maganda po un. Good evening, ask Lang may promo pa kayo manila to Bacolod first week of April? magkano fare from manila to cagayan de oro city? Good pm tanong ko lang Po kung may promo kayo month of December round trip po. Manila to cagayan de oro city mam how much?